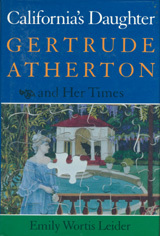 This is the first biography of Gertrude Atherton (1857-1948), a San Francisco native who lived in London, New York and Munich and became one of the most famous, outspoken and successful novelists of her time. It emphasizes her place in the emergent debate on the place of women in society and her friendships with such figures as Ambrose Bierce and Gertrude Stein. "For literary talent, the prize goes not to the prolific Atherton but to her biographer. . . .CALIFORNIA’S DAUGHTER is well organized and paced, the prose noteworthy for its fluency, tact, and dry humor."